On Aug. 15, 2019, exactly 50 years to the day after he performed at the fabled Woodstock festival, Arlo Guthrie will return to the actual site—and give a free concert. Following his performance, the original Woodstock film will be shown on a giant screen. “Wow! Well I’m just off the phone with my daughter, Annie whose day should have ended about a half hour ago. But new developments have made my dream come true, so I’m sharing them with anyone reading this. “I’ve been informed that the folks at Bethel Woods have solved the problems concerning the initial difficulties performing on the original site, which they own. They have proposed that I perform a free show at the original site on August 15th, which is the date I performed at 50 years ago, although this year that will fall on a Thursday. “I have accepted their invitation, and will indeed be doing a show that day as I’d wished. I’ve heard that they will also be showing the original Woodstock movie (also for free) at their normal pavilion that same day. “What kind of show, who will be performing with me, who will be in the band, and a gazillion other details have yet to be worked out. In other words – don’t ask me, I don’t know. 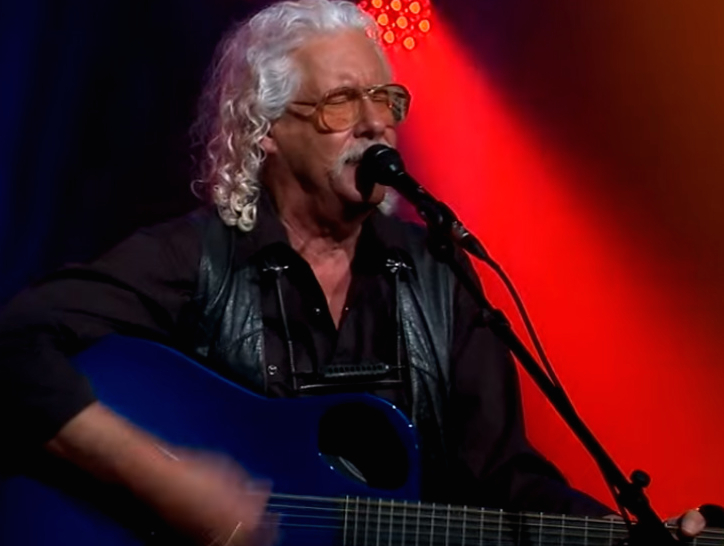 Arlo Guthrie was just 22 when he played the original festival and just a few years into his career as a singer-songwriter, following in the footsteps of his father, Woody Guthrie. Arlo’s classic debut album, Alice’s Restaurant, had been released in 1967 and he was a huge star. He performed a seven-song set on the Woodstock stage, beginning with “Coming Into Los Angeles,” a popular radio hit. He is also scheduled to play the Woodstock golden anniversary being held at the Bethel Woods Center for the Arts, adjacent to the original festival site, the following night, Aug. 16. (He will open for Ringo Starr’s All-Starr Band and Edgar Winter.) However, Guthrie is not among the handful of original Woodstock artists set to play the larger Woodstock 50 event taking place at Watkins Glen,. N.Y., that same weekend.